Bar Rescue Updates: All Bar Rescue Updates - How Many Are Open Vs Closed? 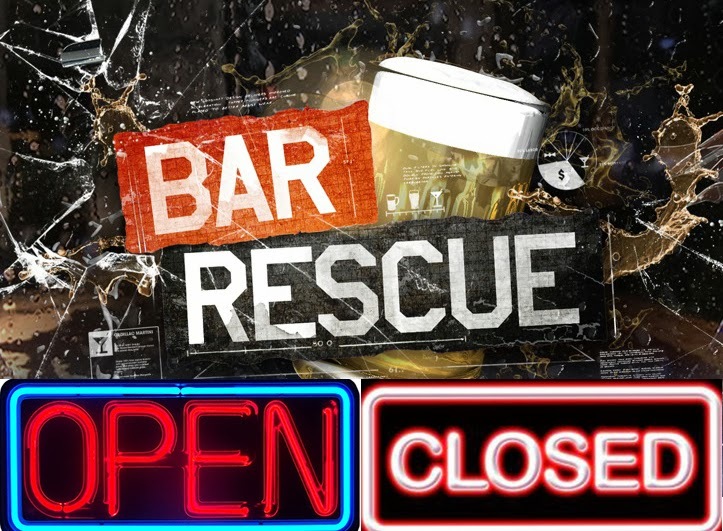 All Bar Rescue Updates - How Many Are Open Vs Closed? Now that season 3 of Bar Rescue is complete, I have put together a list of ALL bars that have appeared on Bar Rescue, and whether they are still open or have closed, as well as how they are reviewed. This list will be kept up-to-date and will be updated as more episodes air and when bars end up closing. As of today, 40 bars have appeared on Bar Rescue, and of those 40 bars, seven have closed, and the rest remain open. There is a tab at the top of the webpage called "Bar Rescue Updates," or here is the direct link to the page. This page has each episode listed, along with the status of the bar and any relevant links. So head over to there to see the detailed analysis of all Bar Rescue bars. Also, keep an eye out for detailed updates for upcoming episodes and past episodes on the blog. canyon inn is it still open? Let's face it people a lot of these bars are run by total retards who should not be in the business at all. I watch the show and when tapper goes into these places I just shake my head at how misrun they are. Tapper should just buy these places and hire people that are competent instead of the smacked asses that own these places. Maybe that's his intent! Build it up to his standards with TV/advertiser money, then buy it out when it fails under someone else's name with none the wiser!